1918, Both William and Tom Henderson were now employees of Excelsior.� William had taken the role of Factory Superintendent at $5,000 per annum and Tom the position of General Sales Manager at $10,000 per annum plus a one-off payment of 200 shares of stock worth $25,000 to be held by Schwinn for five years.� These would be forfeited if Tom was to leave Excelsior on unfriendly terms within this time.� Finally, Tom was receiving a royalty of $2 for every motorbike sold over the next five years or until the design was changed.� The manufacture of the 1918 Model H had been moved from Detroit and the Chicago built models were distinguished by a serial number beginning with Z rather than H.
Hendersons were still hitting the headlines.� Notably, August E. �Blick� Wolter knocked 32 seconds off the 9.3 mile Mt. Wilson Hillclimb record on a stock Henderson.� Wolter followed this some weeks later by driving his Henderson round two laps of Los Angeles� highest rollercoaster. The 1919 Model Z still used the Detroit designs.� Improvements included a GE generator on the Z 2 electric model.� The 4-cylinder engine now had a 70 cubic inch capacity and developed 14.2 H.P.� It sported a new Henderson logo incorporating the red Excelsior �X�. On December 2, 1918 Tom Henderson tendered his resignation with effect from January 1, 1919 to join Melchior, Armstrong and Dessau to export Henderson and Excelsior motorcycles to Europe.� He received the $25,000 from the shares less a $62.50 interest charge.� However, the $2 royalty was stopped from December 31, 1918 due to changes in the rear hub and double rear brake. Arthur O. Lemon is deservingly credited with the design of the revolutionary 1920 Model K.� He joined Henderson as a salesman in 1915.� Arthur had developed a close working relationship with William before joining the Excelsior Engineering Department after the sale of Henderson.� The Model K was a heavier, sturdier, more powerful and reliable machine than its predecessor. The engine�s 79.4 cubic inch capacity (2 11/16� bore, 3�� stroke) was rated at 18 H.P.� It was the first motorcycle to use full pressure lubrication, the oil being held in the crankcase and pumped via pipes and ducts to all the engine bearings.� The cylinders were redesigned to use side-valves for both intake and exhaust, reducing wear and allowing for a more compact, serviceable engine.� Even the frame had special strong steel forgings for every joint.� The forks and handlebars were shared with the Series 20 Excelsior. William Henderson was unhappy with the changes; his vision was a lighter and faster motorbike.� The result was that he left Excelsior at the start of 1920 to form the Ace Motor Corporation with Max M. Sladkin in Philadelphia.� The Ace four went to market a few months later, although did not become established until 1922.� Schwinn consequently placed Arthur Lemon in charge of Engineering for all Excelsior and Henderson motorcycles. The Model K continued production throughout 1921.� An unrivalled increase in Sales bucked the post-war depression.� It demonstrated new levels of performance and reliability: Roy Artley rode one on the 1� mile board track at Conterati, California for 300 miles at an average of 77 m.p.h., exceeding 80 m.p.h. for 100 miles.� Not surprisingly, the machine generated considerable interest from U.S. Police Departments, many of whom had already been using Hendersons for a number of years. 1922 proved to be the epoch of the Henderson marque with the introduction of the Arthur O. Lemon inspired, 28 H.P. (at 3.400 r.p.m.) De Luxe.� The many improvements again concentrated on durability and performance, including: bigger and better carburettor, intake manifold and rear brakes; redesigned crankshaft, cylinder head cooling, exhaust system and saddle.� There were the additional options for Lynite alloy die-cast pistons and a revised reverse gear. Excelsior was keen to demonstrate the new model.� In February, Paul Anderson sped to 98 m.p.h. on a fully laden P.D. Henderson on the Roosevelt Highway in front of Chicago Police, and later at 100 m.p.h. to their colleagues in San Diego.� Both Departments, as did many others, placed large fleet orders for the �fast blue one�. Harley Davison confident in the supremacy of their 74 cubic inch twin, challenged Henderson to a contest that took place in April at Dundee Road, Chicago.� Harley�s rider Leslie �Red� Parkhurst took the maiden victory, but Paul Anderson�s De Luxe won the next eleven, reaching speeds exceeding 100 m.p.h.� The De Luxe had no equal and the record books were at its mercy. Between May 30 and 31, 1922 at the Tacoma Speedway, Washington, Wells Bennet set a new 24 hour endurance record (including all the intermediate records) of 1,562.54 miles averaging 65.1 m.p.h. on a stock Henderson De Luxe, having only stopped for fuel, oil checks and brief rest.� This record was eventually beaten in 1933, by a team of four on a Peugeot. The solo record remained until 1937 when Fred Ham averaged 76 m.p.h. on a 61 cubic inch Harley Twin. Wells Bennet set the Transcontinental coast-to-coast record on the same, although slightly modified, De Luxe: starting in Los Angeles at 12:01 on October 25, 1922 and finishing 3,400 miles and 6 days 15 hours 13 minutes later in New York.� Spurred on, Wells took the Three-Flag Dash a distance of 1650 miles from Canada to Mexico in 43 hours between September 12th and 13th on precisely the same machine. On December 11, 1922 William Henderson, whilst taking the new Ace Sporting Solo out for its first test run in Philadelphia, was struck shortly after 11 a.m. on Castor Road by a speeding motor vehicle driven by Elmer Pfersich out of Folkrod Street.� William, age 39, was taken to Frankford Hospital but never regained consciousness.� The world lost one of its greatest engineers. 1923, Arthur O. Lemon left Excelsior to join Ace as their chief engineer.� The De Luxe continued to amaze: one ran 268 miles from Indianapolis to St. Lois sealed in low gear, with sidecar and passenger at an average speed of 23� m.p.h.� In June Wells Bennet retook the Three-Flag solo record.� He then turned round, hooked on a sidecar, with Ray Smith as passenger, and broke the sidecar record on the way back. On October 20, 1924, Fred Ludlow took a souped up De Luxe with streamlined faring and racing tyres to a record 127.1 m.p.h., officially timed over � mile. The frame was redesigned for the 1925 De Luxe, sloping downward at the rear to give a lower centre of gravity and consequently a shorter but wider 4 gallon fuel tank.� 3 ring alloy pistons became standard; changes were made to the cylinders and camshaft, the low and reverse gear ratios were altered and it was given bigger 3.85� tyres. The excellent 1927 De Luxe had machined and polished �Ricardo� cylinder heads as standard.� Now developing 35 H.P. at 3,800 rpm it required two extra plates in the clutch.� There was a new instrument panel on the gas tank incorporating speedometer, ammeter, oil gauge and ignition switch.� The horn was now on the front fender and the toolbox located under the saddle by the battery box.� Other features included front mudguard splashers, telescoping clutch springs, a new Zenith carburettor and valve spring covers. 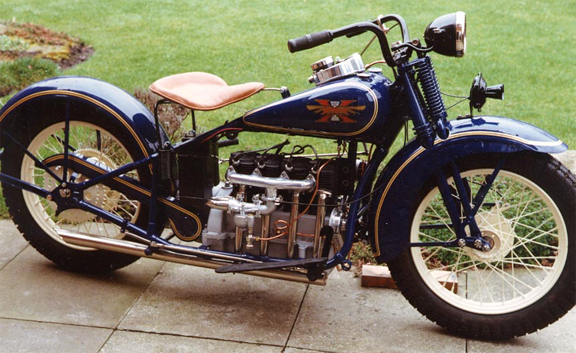 On January 27, 1927 the Indian Motorcycle Company bought the Ace Motor Corporation.� Arthur Lemon made his final career move to Indian.� At Ace, he must be credited with the design of two very special machines the XP3 and XP4, the latter being timed at 129 m.p.h.� The 1928 Indian Ace subsequently became the Indian Four, developed and manufactured until 1942. The final De Luxe came out in 1928.� The engine had higher compression, valve guides were of hardened, polished steel and leading link forks were introduced. In June 1928, Schwinn hired the highly respected and well liked Arthur Constantine, fresh from Harley-Davidson, as Chief Engineer.� �Connie�, an exceptional engineer and enthusiastic motorcyclist, thoroughly studied the now long-in-the-tooth De Luxe, decided that there was only one course of action and quickly started on a bold new design.� The �Streamline� Henderson KJ, his resulting masterpiece, appeared in March 1929, boasting �57 New Features� and developing 40 H.P. at 4,000 r.p.m.� The engine used the earlier design of overhead inlet valves and side exhaust valves whilst retaining much of the compactness of the De Luxe.� Amongst the innovations were a five-bearing crankshaft, more numerous and beefed-up bearings, a �Down-Draft� manifold located above the cylinders, a lower and more central saddle, semi-sport handlebars and the streamline saddle tanks. On Tuesday, October 29, 1929, the Wall Street stock market crash, with $10 billion wiped off share values, heralded the start of the great depression, but Henderson sales remained strong. On April 29, 1930,� Excelsior demonstrate the new Henderson �Special� KL high speed �solo job� on the new smooth highway concrete of St. Charles Road, Illinois.� Joe Petrali took the Henderson to 116.12 and 109.09 m.p.h. on the two recorded runs that were made, averaging 112.61.� The KL developed 45 H.P. at 4,500 r.p.m. and offered higher compression, two-ring pistons, an enlarged 1�� carburettor, redesigned full-floating front forks and 4�� tyres.� The KL had a remarkable top gear range capable of smoothly pulling from 8 to 110 m.p.h.� This outstanding machine quickly became a standard of U.S. Police Departments. 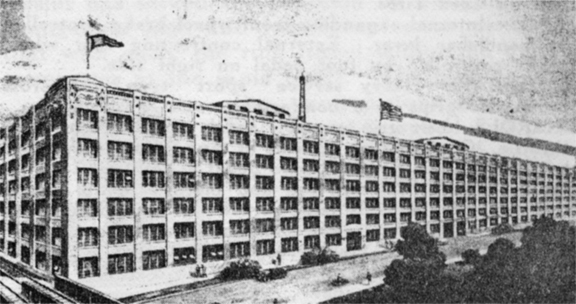 In the summer of 1931 Schwinn called his department heads at Excelsior to a meeting and simply told them, quite out of the blue, �Gentlemen, today we stop�.� He was convinced that the depression would deepen and continue for about eight years.� He was not prepared to take the risk, in spite of the burgeoning order book, and wanted to concentrate on his core business of bicycle manufacture.� By September 1931 it was over.